The inspiration for New Paths is the much-loved and hugely respected Alan Spedding, one of the leading members of the North of England’s musical community, who died in 2014. Organist and Director of Music at Beverley Minster for 42 years, long-time conductor of the East Riding County Choir and Hull Choral Union, as well as a nationally respected adviser, examiner and educator, Alan taught and inspired countless musicians in the East Riding and far beyond. His services to music were recognised by the award of an honorary Doctorate of Music from Hull University in 1994, an MBE in 2003, and the diploma of Associate of the Royal School of Church Music in 2006. Alan’s insistence on the highest standards of music-making, and his generosity in sharing that music with all, are traits that we intend to adopt in everything that New Paths does. We hope he would have approved of Beverley’s newest musical venture. Alan Spedding, one of the leading members of the North of England’s musical community, who was organist and director of music at Beverley Minster for 42 years, has died aged 70. As a choral conductor, organist and teacher he was inspirational and worked long and hard to combine excellence with enterprise, emerging early as a much respected musician during the course of a distinguished career. As music master at Beverley Grammar School, a teacher in Hull, and in his long and devoted work at the Minster, he was an inspiring trainer of young musicians. His work with Hull Choral Union and the East Riding County Choir involved him in preparing and conducting all the major choral repertoire at Hull City Hall and Beverley Minster. His recitals and recordings on the famous Snetzler/Hill organ there attracted a keen and enthusiastic following over five decades, and the restoration of the instrument, completed in 1995 by Wood of Huddersfield, was a major landmark. Many radio and television broadcasts from the Minster and elsewhere brought his name to a national and international audience, as did European recital tours. The Minster Choir played a pivotal role in a Yorkshire Television series, The Psalms of David, presented by James Galway and recorded at Beverley. In 1979 he took the Minster choir to sing at the Festival of Remembrance at the Royal Albert Hall, where he played the organ. Dr Spedding was born in Wimbledon, one of three talented brothers – the other two are twins, one also being a musician and the other an artist. He was educated at Rutlish School, Merton, South London, before training at the Royal College of Music where his studies included cello and organ, the latter with RCM professor John Birch, of Chichester Cathedral. He moved north in 1967 when he was appointed to Beverley Minster, having been one of 56 applicants for the post, following service at St John’s Church, Wimbledon, and Kingston-upon-Thames Parish Church. Two years later, when the East Riding County Choir was left without a conductor for its Christmas Concert, he agreed to cover the emergency. As a result they asked him to stay, which he did for 45 years. At the same time he was teaching in Hull, then in 1971 became organist at Hull Grammar School, and he also conducted Hull Choral Union from 1975 to 2001. On the national musical canvas, Dr Spedding was a devoted supporter of the work of major musical organisations, most notably the Royal College of Organists as council member and diploma examiner, the Royal School of Church Music, the Associated Board of the Royal Schools of Music where he was a popular, perceptive, considerate and courteous examiner, and the Incorporated Association of Organists for whom he was associate editor of the Organists’ Review. 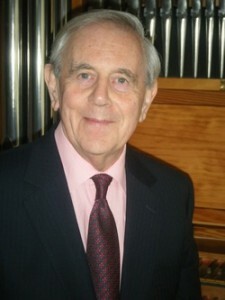 A long association with Hull University, where he was organ curator, was marked by the conferment of an honorary Doctorate of Music in 1994, and his services to music were recognised by the award of an MBE in 2003 and the diploma of Associate of the Royal School of Church Music in 2006. In recent years, a number of his published organ and choral compositions have achieved considerable prominence both in this country and abroad. Two sets of variations for organ founded on plainsong themes – Urbs beata and Victimae Paschali laudes – commemorate close personal associations and were dedicated respectively to Hull University Vice-Chancellor Professor David Dilks and his wife Jill and Huddersfield Town Hall organist Dr Gordon Stewart. Dr Spedding also studied and lectured on the Minster’s collection of mediaeval musicians, its famous minstrel carvings being one facet of its history on which he was a noted authority. In Alan Spedding, a quiet, easy manner was combined with an irrepressible good humour and a rare capacity for friendship. He and his wife Ann, who is a piano teacher, were married at St John’s Parish Church, Wimbledon, where one of his distinguished predecessors was the noted composer of “light” music, Albert W Ketèlbey. Dr Spedding is survived by his wife, their sons John and Christopher, and six grandchildren.